I woke up at 5:00 am and listened to the weather. “North Vancouver Island: winds light, increasing to southeasterly 10-15 knots in the afternoon.” Perfect. Then the lighthouse report. 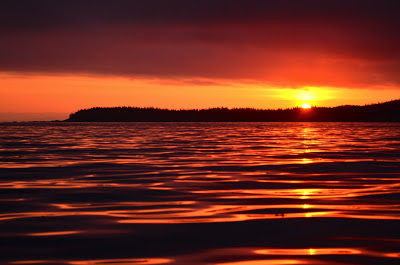 “Cape Scott: winds south five, low southwesterly swell, one foot chop.” Yep, today’s the day. I headed off, running at an easy 14 knots in calm water. Slack water at Nahwitti Bar, a shallow section of water beginning not far from Bull Harbour, was at about 5:45 am. The timing was perfect, and the crossing was smooth. The sunrise was spectacular. A small swell rolled under the boat, but it was totally comfortable aboard. I spotted a few whales in the distance, but never saw them up close. 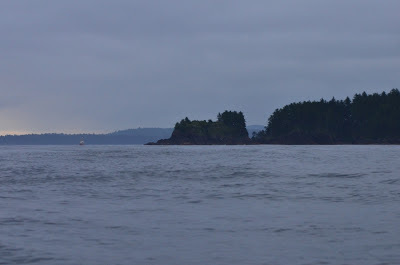 As I approached Cape Scott, I saw the Canadian Coast Guard Cutter Tanu anchored close to sure. I certainly didn’t expect to need their services, but their presence is comforting. 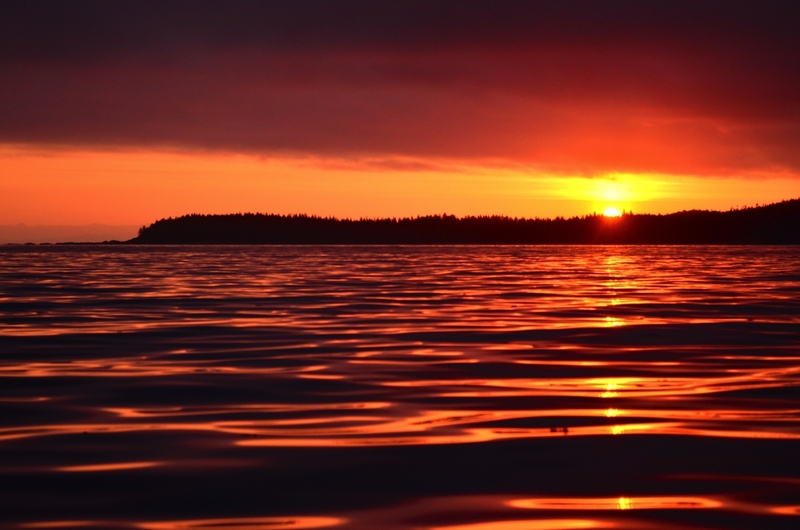 Cape Scott, the northwestern most spit of land on Vancouver Island, juts into the open Pacific Ocean. It’s surrounded by rocks, and even on calm days swells break ominously on the reefs. 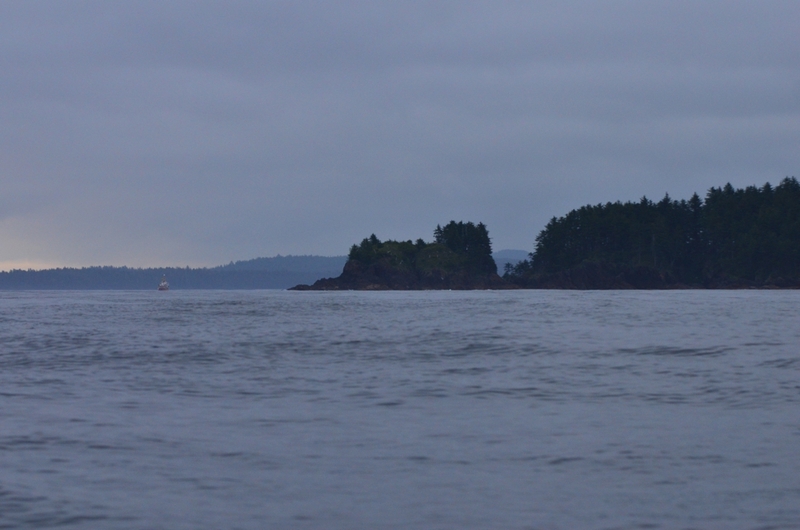 More problematically, currents converge at Cape Scott. Out of nowhere, the seas heaped up and became both larger and steeper than just a few minutes before. But then, just as quickly, they subsided. About ¼ mile of rough water. Cape Scott behind me. Not the Coast Guard Cutter Tanu on the left side of the picture. 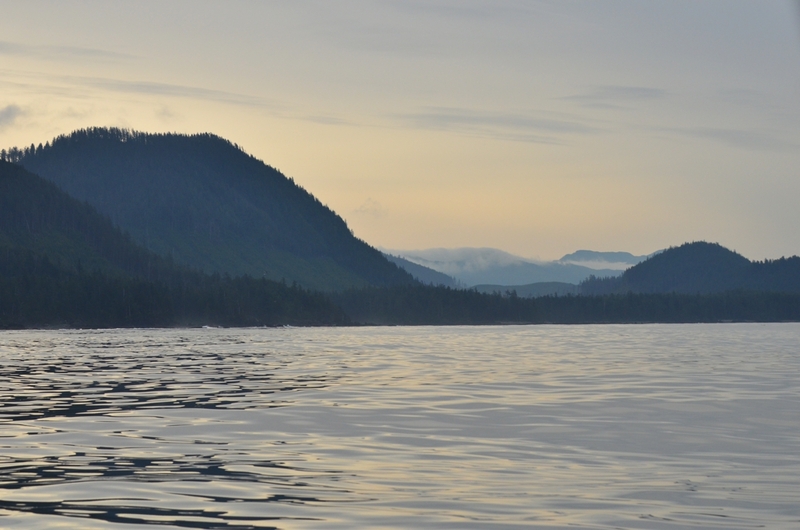 With Cape Scott behind me, and once again in calm water, I set a course for Sea Otter Cove. This is the first good protection south of Cape Scott, and though I didn’t intend to spend the night, I wanted to take a peak inside. Indeed, it’s a beautiful spot; isolated, yet secure. After looking inside, I once again ventured into the ocean, bound for Quatsino Sound. I saw sails in the distance, and gradually they become closer and closer. Yep, the Van Isle 360 fleet again. They’d been sailing non-stop for 24 hours, and I was passing them after just five hours under power. 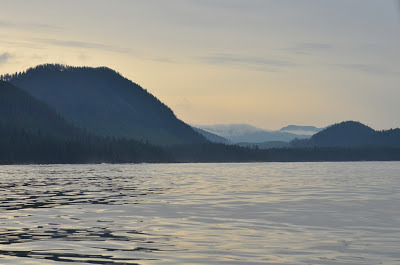 I pulled into Quatsino Sound around 9:00 am and anchored at the mouth of Browning Inlet. I made breakfast, then took a nap. When I awoke I paddled around the bay, and spotted a mama bear with two cubs. 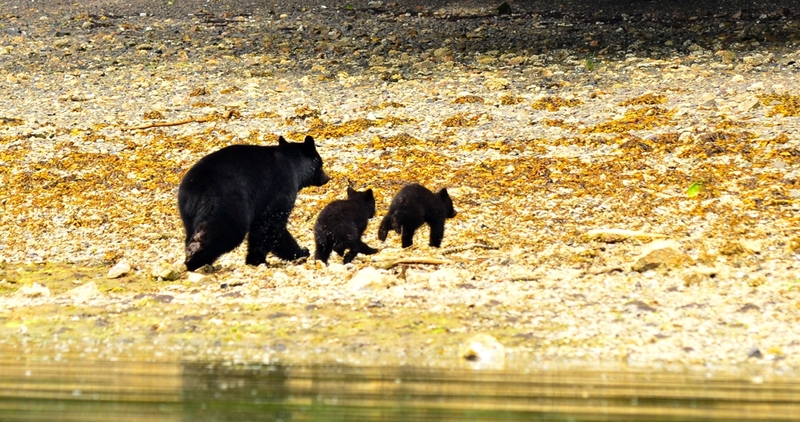 They were awfully skittish, and ran back into the woods after seeing me. Throughout the afternoon the Van Isle 360 fleet filtered in. They’re all bound for Winter Harbour, surely overrunning the place, so I’ll stop in tomorrow after they’ve left.